Preheat oven to 375 degrees F. Grease an 8-inch round cake pan with nonstick cooking spray. Cut a piece of parchment to fit the bottom of the pan. Place it in the bottom of the pan and spray it with nonstick cooking spray. Set aside. To make the cake, put the chocolate and butter in a large microwave-safe bowl, and heat until the butter is melted and the chips are soft, about one minute. Stir until the chocolate is melted and the mixture is smooth. If you need to reheat, do for 10 seconds at a time and stir. Add the sugar, salt, and vanilla extract and stir to combine. Add the eggs and stir until smooth. Add the cocoa powder and stir until just combined. Don’t over mix. Pour the batter into the prepared pan and bake the cake for 25 minutes or until the cake has a thin crust on the top and the center registers 200°F on an instant-read thermometer. Let the cake cool on a wire cooling rack for 10 minutes. Loosen the edges of the pan with a butter knife and carefully turn it upside down onto a cake plate or serving plate. The bottom of the cake will now be the top of the cake. Let the cake cool completely. While the cake is cooling, make the chocolate ganache. Combine the chocolate and cream in a medium microwave-safe bowl, and heat until the cream is very hot so it will melt the chocolate. I always start with 30 seconds and check it. It might take longer, it just depends on your microwave. Remove from the microwave, and stir until the chocolate melts and the mixture is smooth. 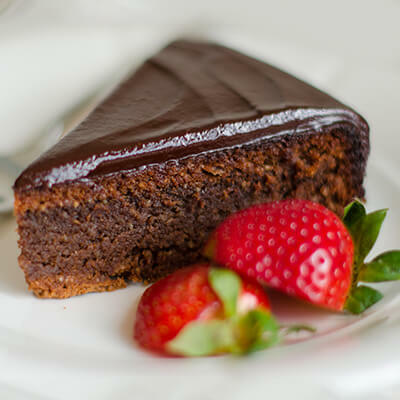 Spread the chocolate ganache glaze evenly over the cooled cake. Let the glaze set up for a few hours before cutting and serving the cake. I always put it in the refrigerator to speed up the process. Cut the cake into slices and serve with powdered sugar and raspberries, if desired. This cake is also great with whipped cream or ice cream.